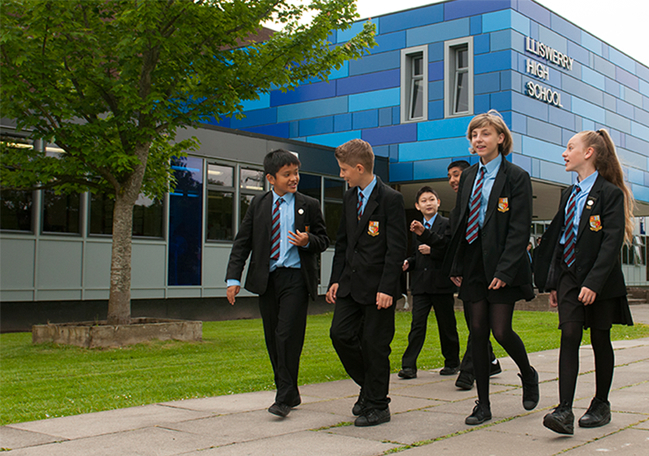 Lliswerry is proud to be an inclusive school with learners from a variety of ethnic backgrounds and cultures. We are a mixed comprehensive school maintained by the Newport Local Authority (LA) and catering for the 11 to 18 age range. The annual intake is around 140 learners and we have a teaching staff of approximately 60 teachers assisted by administrative and technical staff and learning support assistants. The school is situated in south-east Newport, approximately two miles from the M4 motorway and on the boundary between Lliswerry district and the more rural areas of Nash and Goldcliff. Built in 1974, it occupies a large and open campus and has the distinct advantage of being a single building under one roof. We are constantly striving to ensure we provide a stimulating school in which to learn and are continuing to undertake an extensive programme of redecoration and refurbishment. Recent improvements include the new front facade with upgraded classrooms, modern IT facilities, bespoke Sixth Form facilities, modern drama studio and a music jampod suite. Sporting facilities are excellent. They include a large Sports Hall and a purpose built football facility, managed by Gol, Wales largest 5-a-side and 7-a-side football provider. As a school community we offer a dedicated staff and governing body who are committed to providing the best possible educational experience and support for our learners.